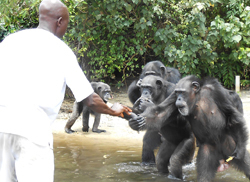 A coalition of more than 35 organizations, including AAVS, are working together to help over 60 former lab chimpanzees in Liberia, who were abandoned by the New York Blood Center (NYBC). According to a New York Times article published on May 28, NYBC set up a lab in Liberia in the 1970s, so it would have easy access to chimpanzees to use in experiments to study hepatitis and HIV. The chimpanzees have been retired for at least a decade, and, in the past, NYBC has acknowledged its responsibility to financially support these animals, including in retirement. However, as of March 6, it has completely stopped all funding. Your help is needed to provide emergency support for these chimpanzees! Make a donation today; 100% of your gift will go directly towards helping these chimpanzees. Although the chimps live on six mangrove islands where they can move about freely, they are completely dependent on humans for their care, especially for food and fresh water. In fact, before the fresh water system was fixed, caretakers had no other recourse but to give the chimps cups of water to drink every other day. unacceptable and ethically indefensible. Please voice your support for the chimpanzees abandoned in Liberia by sharing this page and by making a donation to help with their immediate care.